Last night was Halloween. Today was All Saints Day. She and I set off for the Carlisle Reservation of Lorain Metro Parks for a hike in the woods. What should we encounter but the quiet settings for the System's Halloween Fair which draws thousands of family visitors each year. 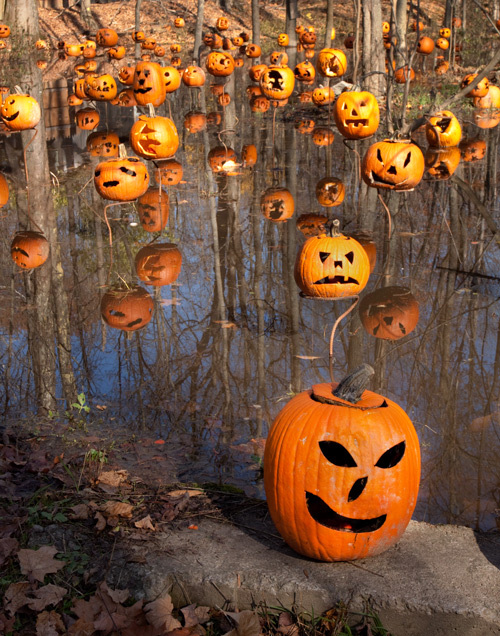 Among all of the oddities seen along the trail oddest, to my eye, was a swampy area, called Pumpkin Lagoon, populated by dozens of Jack-O-Lanterns all hovering above the still waters! It would have been spooky by night; by day it was simply surreal. 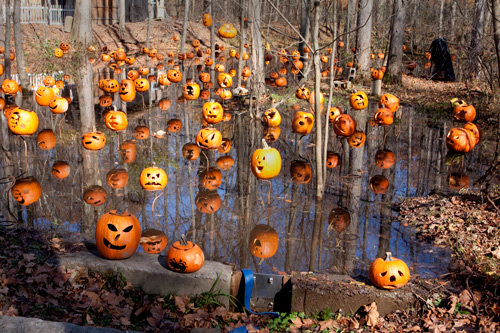 The only photos I shot this day were of the carved pumpkin heads in that swamp. Do not take lightly the sight recorded, however… I don't remember seeing that black shape in the background and I don't think it's in any of my other photos! What's that!! Why, that's Death, of course! He used his scythe to carve all of those pumpkins, surely. Good to see you're still here. That's sort of cool and creepy all rolled together! Aubrey may be right. Weird stuff! That's amazing!! It must be quite a sight at night.